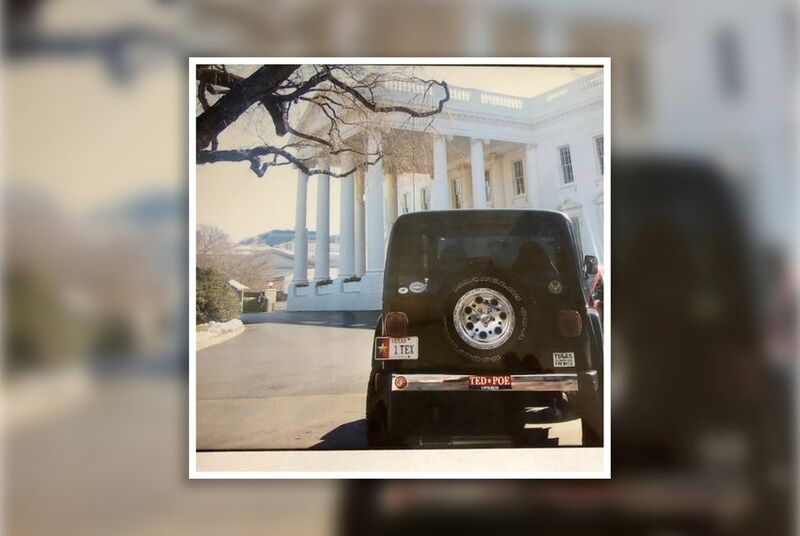 U.S. Rep. Ted Poe fondly recalls the time he was allowed to drive his Jeep directly onto the White House driveway while George W. Bush, a fellow Texan, was president. Photo courtesy of Congressman Ted Poe. WASHINGTON – In his farewell speech to the U.S. House of Representatives, retiring U.S. Rep. Ted Poe jokingly quoted an old adage from one of the most famous Texans ever. "So this is where the cowboy rides away, Mr. Speaker," the Houston Republican said. "Also, at the end, there is really no better good-bye than the words of Davy Crockett when he left Congress, when he said, affectionately: 'You may all go to hell, I am going to Texas.'" Poe and eight other members of the Texas delegation are set to exit their offices in Washington on Thursday. Together, they represent one-quarter of the state's delegation in the U.S. House and nearly two centuries of combined congressional experience. The departures include multiple committee chairmen and members whose tenures date back to President Ronald Reagan’s second term. The Texas Tribune interviewed seven of the nine Texas members departing Congress and asked them to reflect on their time in Washington. U.S. Reps. Beto O’Rourke, D-El Paso, and John Culberson, R-Houston, declined requests for interviews for this story. For two departing members – Joe Barton, R-Ennis, and Pete Sessions, R-Dallas – the stand-out moments of their tenures involved children making for surprisingly effective lobbyists. Barton is the delegation's longest serving member, having entered Congress in 1985. A few years into his tenure in the late 1980s, he got a postcard from a little boy telling him that his older brother had recently been killed in a three-wheeled ATV accident in his front yard. Moments like that were among the best parts of serving in Congress, Barton said. 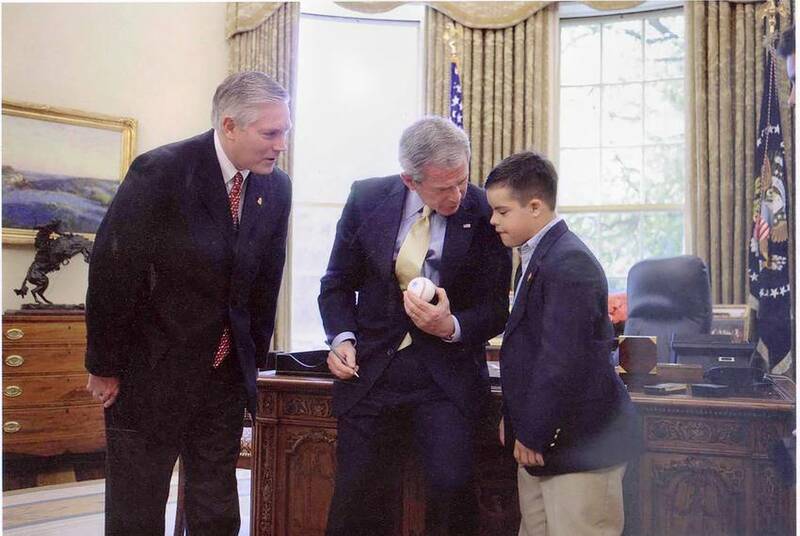 Alex Sessions, right, son of U.S. Rep. Pete Sessions, left, meets President George W. Bush, center, before the passage of Sessions' "Family Opportunity Act" in 2006. Photo courtesy of U.S. Rep. Pete Sessions. For two other Texas Republicans, the decision to leave office was made easier by Republican conference rules that limit chairmen from serving more than six years as the party’s top member on a committee. U.S. Rep. Jeb Hensarling, R-Dallas, who is finishing up his 16th year in Congress, is the current chairman of the House Financial Services Committee. U.S. Rep. Lamar Smith has chaired three committees during his 32 years in Congress: ethics, judiciary, and science, space and technology – where he is currently term-limited. Hensarling, Poe, Smith and U.S. Rep. Sam Johnson, R-Richardson, all decried and pointed to a growing lack of respect for opposing viewpoints as what has changed for the worst during their time in Congress. Smith said that the members of all parties should work harder to not "take another member's name in vain." "Talk about the issues, not the person,” Smith said. Poe shared a similar sentiment. On the flip side, Poe and Johnson both said that the way Americans and the government treated veterans and military issues has improved during their time in Congress. Aside from institutional improvements over his time in Congress, Hensarling jokingly said that the quality of the barbecue has improved at the weekly gathering of Texas lawmakers. On a more serious note, Hensarling said what’s changed for the better during his tenure is the ability to make law under the Trump administration, especially in his position as a committee chair. Hensarling pointed to Congress rolling back some banking regulations passed in response to the 2008 financial crisis, and overhauling the Committee on Foreign Investment in the U.S., which is tasked with reviewing the national security implications of foreign investment in the United States. “I’ve got a nice collection of signing pens that my children can fight over one day once I've assumed room temperature," Hensarling said. Sessions, the chairman of the powerful House Rules Committee – a position through which he served at the pleasure of the speaker – said he wished he could’ve done more to control federal spending. Poe said the one thing he would change about Congress would instituting a requirement that Congress pass its budgets every year. This year marked the first time in a decade that Congress passed the Department of Defense budget on time. The story was similar for other agencies, while others are still being funding through temporary spending bills. Poe told the Tribune that his top legislative accomplishment during his 14 years was the Justice for Victims of Trafficking Act, a 2015 bill that helped police fight human trafficking, as well as aided victims in their recovery. But Poe’s favorite memory from his 14 years in Washington came when fellow Texan President George W. Bush was in the White House. In terms of legislating, U.S. Rep. Gene Green, a Houston Democrat who is retiring after 26 years in Congress, said he’s going to miss the fine art of negotiating with members on contentious issues, sometimes over longer periods than anyone expected. But House rules do not inherently facilitate bipartisanship, leaving it up to the members of the majority party to actually involve the minority party in deliberations. In the House, minority members have limited capabilities to delay or block legislation. Barton has served 20 years in the majority and 14 in the minority. He said that if he could change one thing about the House as an institution, he would give the minority party increased legislative rights, an interesting answer from a former chairman who spent most of his time in the majority. His first decade in Congress was spent in the minority, during which said he didn’t get a single vote on one of his amendments. The departing Texas lawmakers all expressed excitement to be returning to Texas to spend more time with their families. Yet some of them don't expect to stop working. “I’m not going to be sitting on the porch in a rocking chair with my favorite Dalmation sitting next to me,” Poe said.